Competition pushes us to strive more for excellence and in the case of television, a three-way fight is most welcomed by the audience. Some of us who are 'die hard' fans of a certain TV station might not embrace this but unconsciously, really, no one will benefit from an ongoing close contest but us, the viewers. We deserve great shows, don't we? With that said, I was quite interested when TV5 entered as the third player between the GMA vs ABS-CBN rivalry. In March 2, 2010, Manuel V. Pangilinan announced that Philippine Long Distance Company's broadcasting division MediaQuest Holdings Inc. is buying TV5, paving way for a start of an all-new programming. We all know that by now as we felt the presence of shows like Talentadong Pinoy, Face to Face, Amazing Race Philippines and Artista Academy to name a few. After nearly three years of being number 3, and at times, number 2 or even number 1, TV5's Chief MVP said during the TV5 Press and Trade Launch at the Newport Performing Arts Theater in Resorts World Manila last January 15, that it's time to "push it even more for a bigger TV5". "We are in that point again where we ask ourselves what we have done and what shall we do next. TV5 will be better", MVP added. 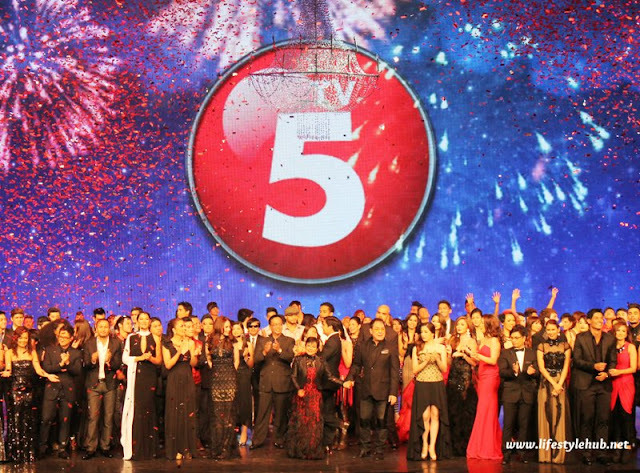 For 2013, TV5 will add more spice to television by introducing new shows which they hope will get more viewers. Edu Manzano is joining the Good Morning Club with Christine Bersola- Babao, Chiqui Roa-Puno and Amy Perez, while he stay as Joey De Leon's partner in Game N Go All Stars together with Gelli de Belen, Arnell Ignacio, Daniel Matsunaga and Shalani Soledad-Romero. On primetime, Derek Ramsay has been clothed as Kidlat in the new superhero drama series which has said to be raking in more ratings for the network. Meanwhile, in what I should say as the stellar cast composed of Cesar Montano, Alice Dixson, Gardo Versoza, and Nora Aunor, Never Say Goodbye is the newest primetime drama series that will also star Artista Academy winners Vin Abrenica and Sophie Albert with Edgar Allan Guzman. As The Amazing Race Philippines concluded, TV5 will run two more reality shows including the Alabang Housewives which, in my opinion, appears to be a local counterpart of Keeping Up with the Kardashians. The housewife duo of Pamela Spella and Vanessa Ishitani are ex-contestants of the Amazing Race. There is also Jeepney Jackpot: Pera o Para which will feature a jeepney roaming around the metro and giving away prizes. The show will be aired from Monday to Friday at 5 pm. Middle East, North Africa and Europe. The long list of new shows continues with Joey de Leon's Hayop sa Galing, a show with pretty similar format as Wow Mali! and the re-energized new show of Willie Revillame called Wowowillie. The variety show host will go back from primetime to noontime. The public affairs team has also cooked up new shows including Paolo Bediones's Rescue 5 and Luchi Cruz-Valdez's Balwarte. But as a blogger, probably what I am most amazed by TV5 right now are its digital efforts. With a full- blown news website InterAksyon.com and a sports portal InterAKTV.com, TV5 is also tapping the attention of our netizens with who they call the digital go-to girl Kristn.com. Kristn talks about lifestyle, covering from movies, music and events, tech and gaming, fashion and beauty, travel and even night out. This app is downloadable in your iPhones and Android phones too! Seems like we are off to a promising year with TV5. I am not a full-pledge kapatid, nor am I a kapuso or a kapamilya as I have favorite shows from one station to the other but this force shown by TV5 is something to look forward to. This only means 2013 is a good year for Filipinos, atleast in our favorite communication and entertainment medium, the television.